We are going to be heading over to fish the Yellow Fin Tuna in a couple of months most likely in the Canyons. Last year, we stayed in West End at Bootle Bay which we love however it's a hike to get to the Canyons. Lucaya would save a bunch of fuel and time so we were wondering about these 3 hotels OR any other hotels you might recommend. We were also interested in the dockage (do they charge extra and do they have someone who watches the boats all night long) and fees as well, which were closest to shopping or to the International Bazaar, Casinos, etc. Sunrise is by far the least expensive for a room and slip. The downside that it is basically in the middle of nowhere. No restaurant nearby and you will need to rent a car or hire a taxi to the nightlife and restaurants. If you are staying multiple nights, I would suggest staying at one of the many hotels in Lucaya. We stay at sunrise all the time. No issues so far. Always someone on duty to watch out for boat. It is in the middle of nowhere but taxi ride is only 15-20 bucks. We take our own cooking equipment so very seldom do we ever need to leave. We usually fish sun up to sundown and make our own night life at the hotel. When do you plan to go? Try ocean reef club in Lucaya. It's just west of bell channel. Is that the "resort" that provides dockage directly behind the units? Eric, I would suggest using a cable with a huge ss lock each night to secure your boat. Eric, we stay at Pelican Bay. I like sunrise. I've not taken wife and kids but good place for a cheap fishing getaway and super nice staff. They have a night watchman but I was told by staff to take rods into room, which is right there. Correct, no restaurant on site but easy to get a cab and rooms were really cheap on hotels.com last year. Not super nice, but decent shower, ac and fridge in room. Clubhouse and pool on point that we did not spend much time in but good meeting area for a group. Dockage outside room cheap as well, I can't remember how much but not a lot and included water for engine flush and wash down, just bring a hose. I had no mechanical issues but the old running Mon marina split in two so a marina/mechanic across harbor and fuel. Knowles marine now I believe. I cleared customs at OBB but for $40 sunrise can have customs meet you in marina to save time and fuel if you don't want to stop at west end first. Also, sunrise ordered a load of ice for us. Think it was around $4.50/10lb bag, delivered to boat. I caught 1 mid size yellowfin, a few blackfin and some Cuda. Deep water right off sunrise and we chased the birds last August. Did not fish super hard and larger ballyhoo caught larger Cuda. Most meat fish were on lures. Also, believe Sunrise has a BoatUS discount. I'm a Seatow member so did not get that, but they have a few different discounts if you email them and ask. Just checked and Hotels.com is $75/night a few months from now, which I think is more than I paid last time, but still not a bad deal for the fishing right off shore. Yes it is Jeff. Very reasonable I believe we paid $200 for a very nice 2 bedroom suite with a full kitchen that sleeps 6 people easy. That would be an epic trip. Tuna, hog, grouper and lobster? Pretty sure you can't eat better. I am planning to run over between the 17th and 25th of March for my first tuna trip was planning on Bootle but Lucaya would work. Whats your schedule? Weather permitting we plan to be there the week before you. I'll let you know how it goes. Will probably go back on the 24th also so if you can fill me in for the next week would be great! Gator Al, sounds great to me. Please pm me with your number. Yup, that's Ocean Reef. I have stayed there 6-7 times, and always been happy with them. We did two different forum bashes there a number of years ago. They have the villas and hotel rooms. Thanks, that would be my first choice! Thanks fellas for the recommendation on Ocean Reef as we usually stay in Bootle and make the run. Will look into OR. We are looking to run over in late March early April for a few trips across. I was jus tin Lucaya 2 weeks ago. Before you head over check and make sure you know whats open or not. I did hear that some of the places are still closed from the storm. Not sure which ones, we stayed at Port Lucaya marina and had no issue. The casino was closed which was probably a good win. I will second this choice. We have stayed at Flamingo Bay half dozen times. The rooms are dated, but clean and cold. The marina is just outside your door, so you can keep an eye on your boat. The water taxi docks there, so a $5 boat ride gets you into town. Also across the street is a resort with a lazy river pool and a swim up bar, all free. They run dive and snorkel charters out of the marina, so there is constant movement during the day. If you take care of the dockmaster, you belongings will be fine. Room and slip average around $100 per night. From what I understand, the night watchman at Sunrise loves Coors Light. Bring him some and you'll have a friend for life. Sorry for the late response but been out of town. Thanks so much for the info! I'll give you a call on Saturday as I'm flying to Beijing tomorrow and home Friday night. Also, are you talking about using a cable at all of the hotels or just the Ocean Reef Yacht Club?? Thanks for the comeback. We are basically open on our time over there. We would like to time it for a good crossing in both directions and to make sure the YFT is in the Channel. Thank you much for the recommendation. It looks like a really nice place. We will look up the Pelican. Good enough for the Team 3 Buoys then good enough for us too. I'll give you and Stacey a shout when I get home from Beijing. Great info!!!!!!!! Thank you very much. We have to pass right by OBB on the way to Lucaya so I was curious why it would save gas and time to clear at Sunrise versus shooting into OBB. Let me know. Thanks again. Let's get together and see if we can coordinate..OMG... another Osprey/Plane Fish N meeting in West End. Do you think they could stand us????? LOL. It will be Jay, Chad, Steven, Doc and myself most likely. I'll keep you posted. What are your thoughts about locking up the engines with cables and locks??? We never had to worry about that at BMC or Bootle for sure. Great advice. Sunrise is open for business. Flamingo Bay is only accepting 3 or 4 boats max and they are still trying to get big bucks for their rooms and service (can't figure that one out for the life of me). Island Palm Marina is also open. Spoke to Flamingo Bay just the other day and their prices are ridiculous for the reduced amenities. First, they are the ones who only have dockage for 3 or 4 boats. Then the saleslady who called me back told me that a room for up to 4 people is $216 (not bad)... but.... that is for double occupancy. For person 3 and 4, the rate is now $345 a night PLUS dockage!!! I stopped her right there and moved on. That's so funny. Actually, the "new" customs officer at OBB (Davis) also likes Coors.. but not LIGHT and specifically asked for me to bring a case of 24 in bottles only. LOL. I told him I'd get right on that. Sorry, you are correct since further north than me. I cross from further south and can go straight into freeport. Eric, we are planning to go over the last week of May and again the last week of June, will likely leave here monday and come back on Friday unless weather pushes us a couple days one way or the other. We typically stay at Tiano Flamingo Bay which is nothing fancy. The hotel reminds me of motel 6 but on the water, they have a water taxi for $4.oo each to go to the Market and back, they have a restaurant on property, nothing fancy but prices are reasonable as well. We typically bring our own food and will eat either a lunch or a dinner out just for a change. We go to fish not for the party scene. They do a dinner/drink/bonfire usually 2 nights a week and I seriously doubt you can beat their prices. The people have been really friendly, and the dockhand Terrance, (finally figured out his name) is super helpful if you need anything. They do have 24 hour security but the guard is not right at the marina he is centralized on the property. Across the street where the restaurant is, they also have a swim up bar, water slide and lazy river, for the non fishing people or days. Keep in mind it is not a 5 star resort on the marina side, the other side is a time share set up. I do know they got hit real hard with Matthew, in fact they just got their pool filled back up about 2 weeks ago. In the past their rates were unbeatable but expect that to change this year after all the repairs from Matthew. We used to pay $100 a night for a single king or 2 double bedroom and if you stayed 4 nights they would include the dock space. I do not know if that will be offered this year. The room also had a kitchenette, which was a mini fridge, toaster, microwave and a small sink counter area. We bring a small gas grill and a single burner gas stove and that is how we eat the whole time. We always stay at Flamingo, Kevin described it perfectly above, just talked to them yesterday and no rate change, 4 person room with boat slip was just over $200. Hope to head over Thursday. Seriously....the last guy is gone? Oh I wish I could remember his name...it's right on the tip of my tongue. He was a bit upset when we showed up on a return trip from the Abacos without said Coors Light. 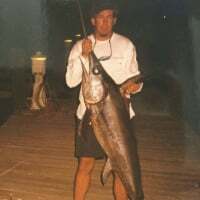 The next morning he started telling me about the Tiger sharks in the marina and how he'd personally killed four of them with his hands...."a four footer, a six footer, and a ten footer"......I didn't have the heart to ask about the fourth one, haha. a lot of great information on this thread. thank you. as to fuel, i understand that in Bell Channel, only Grand Bahama Yacht Club Lucayan Marina Village has fuel, is this correct? Rafael, you are correct Sunrise and OR do not have fuel. Not all hotels in that area have dockage either. There are several updated Bahamas cruising guides that have all this info and more. Good to have when planning a trip as well as important recent info on threads like this one. Eric, I never had any issue at OR, even with a boat with twin Yammies on it. I did meet a guy who who was staying the there who told us he got up one morning to find his contender with every line untied, and only still there because he had cabled it around a dock piling. I don't think that was very common there, but locking up your boat defiantly couldn't hurt. Mine gets cabled up anytime it is docked on the water. I won't list the security things I have in place, but it is certainly a concern anytime I am away from it. I do usually leave a cheap spinner in a rod holder just to test and see if it goes anywhere. Hasn't yet. I had an issue at Ocean Reef during a Bahama Mama Bash. My mechanic was working in the engine room, and some lunatic started throwing bananas down at him. Luckily we restrained the crazy person, and forced him to drink tequila until he surrendered peaceably. There is a lot of useful information in this thread, as my wife and I hope to make our first crossing for our anniversary May 29th. Hoping for very good weather as we will be on a 19ft Cape Horn... Still planning and taking in all the very good info from the experienced here. Wife is getting excited about making the trip.